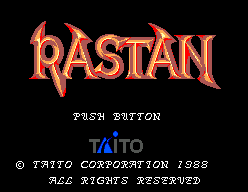 Rastan - Games - SMS Power! 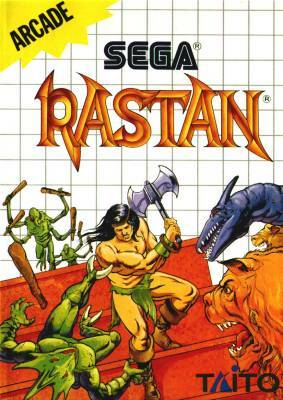 79 CVG magazine "Complete Guide to Sega"
Referred to as Rastan Saga on the Game Gear and Arcade versions. It's the red hot arcade game now playable on your Sega System! 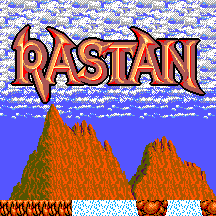 You are Rastan, an iron muscled barbarian from the cold northlands. A bounty hunter by trade, you fear no man or dark, slavering beast! For you are a master of every edged weapon! Now, a king has given you a quest. 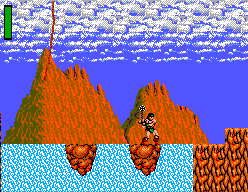 Rescue his daughter from the deepest reaches of Semia; a land where even villains fear to tread. Succeed, and wealth beyond your wildest dreams shall be the reward. Take destiny into your own hands. Journey through seven rounds into the darkest heart of Semia, using magical weapons, armor and potions you find and win on the way. 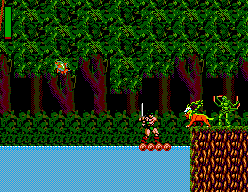 At every turn you'll encounter nightmarish creatures determined to stop you. But beware...the king has sent over one hundred men into Semia...and each has met his doom! Will you?